Indonesia is a country with many active volcanoes. The phenomenon of a volcanic eruption is common in some parts of Indonesia. 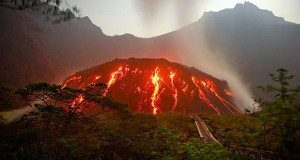 Some of the volcanoes in Indonesia are very dangerous as there are several volcanoes that have erupted. Based on recorded history, several volcanoes that erupted here have caused many lives and damage to property. Below will be explained some of them. 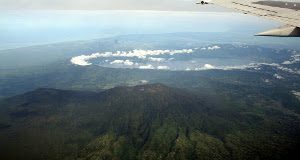 Mount Tambora is an active stratovolcano mountain located between Dompu and Bima districts, Sumbawa, West Nusa Tenggara Province. The volcano erupted on this mountain on April 10, 1815. This mountain explosion was the most powerful in Indonesia. 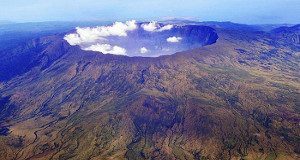 In fact, Mount Tambora also categorized into the historical record as the world’s largest explosion. This mountain explosion is the culmination of volcanic activity that began to increase for almost four years. Approximately 71,000 people around Sumbawa died of lava, as well as a dust-induced disease from the mountain. 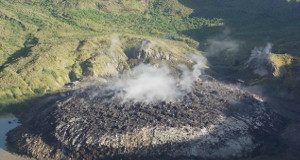 The impact of the eruption of Tambora mountain also can be felt in the entire world. 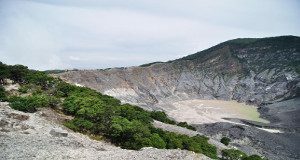 This mountain is located in Sunda Strait and erupted on 26-27 August 1883. The eruption of this mountain is also very powerful and can be felt from greater distances. The volcanic activity from the mountain has occurred since May 1883. The explosion of this mountain caused great disaster in areas such as Banten. Many residents died from exposure to hot rock material spewed from the mountain and also as a result of this eruption of Krakatau causes global climate change. The world was dark for two and a half days due to the volcanic ash that covered the atmosphere. The sun shines dimly until next year at that time. In the 13th century, there was a mysterious eruption and Mount Samalas in Lombok, West Nusa Tenggara was touted as the culprit. Experts successfully linked traces of sulfur and dust obtained from the southern poles with data from Lombok. Mount Samalas is a mountain that has been replaced by Mount Rinjani in Lombok. This mountain has been destroyed by its own eruption. The eruption of Samalas mountain occurred in 1257. The eruption of this mountain spewed rocks into the earth’s atmosphere about 10 cubic miles. This mountain is very dangerous because based on modern records, the eruption occurred periodically every 6 years and is surrounded by a high population having farms near the mountain. 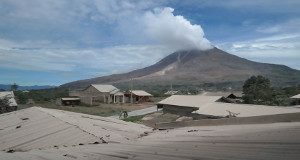 Since 1548, this mountain has erupted as much as 69 times. Mbah Maridjan figure well known in Merapi and often remembered during the eruption incident of Mount Merapi. He is the caretaker of Mount Merapi volcano who died during the eruption of the mountain in 2010. 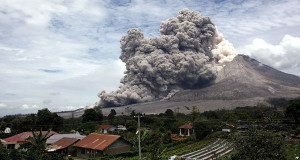 The terrible phenomenon during the eruption of Mount Merapi is widely observed. Many casualties were recorded during this eruption. About 153 people died and 320,000 other residents have to lose their homes. Mount Kelud is a mountain located in Kediri, East Java. In 2014, Mount Kelud erupts with a very large eruption. The material released resulted in several disasters in several cities on the island of Java. Rain sand also hit some cities like Kediri, Yogyakarta, Surabaya, and other cities. Mount Agung in Bali had several times of eruption. The most powerful eruption occurred in 1963-1964. As a result of this volcanic eruption then 1,549 people died, About 1,700 homes were destroyed, about 225,000 lost their livelihoods, and about 100,000 people had to be evacuated from the danger zone. A total of 200 people were killed by the aftermath of a lava flood that destroyed the village on the southern slopes of Mount Agung. 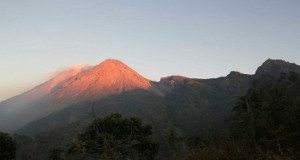 Mount Galunggung is a volcano with an altitude of 2,367 meters above sea level, located about 18 km from downtown Tasikmalaya. To reach the top of Galunggung, the local people built a stairway that has 620 steps. Mount Galunggung eruption occurred on 8-12 October 1982. The most recent eruption occurred in July 1882. The eruption of this mountain accompanied by lightning and produce very hot reddish sand rain. It also produces fine ash, hot clouds caused by lava. This eruption has killed around 4,011 people and destroyed 144 villages. 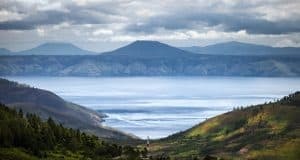 Mount Toba is classified as Supervolcano. This is because Mount Toba has a large magma pouch that if it erupts created a huge crater. The average Volcano from other mountain produces hundreds of meters of the crater, while Supervolcano like Toba can produce tens of kilometers. The Maninjau Caldera formed by volcanic eruptions is estimated to occur some 52,000 years ago. Deposits of the eruptions have been detected in distributions surrounding Maninjau which reaches up to 70 km to the east, 90 km to the southeast, and east to this coast. Sinabung Mountain located in Tanah Karo Regency, North Sumatera has erupted on Sunday, September 29, 2012. All residents around the foot of Mount Sinabung are also reported to have been evacuated to Kabanjahe town. 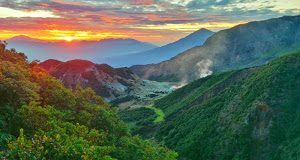 In the historical record, Papandayan volcano has been recorded several times erupted on August 12, 1772, March 11, 1923, August 15, 1942, and November 11, 2002. The great eruption that occurred in 1772 destroyed at least 50 villages and killed about 2.957 people. The area covered by dust volcano reaches 10 km with a width of 5 km. 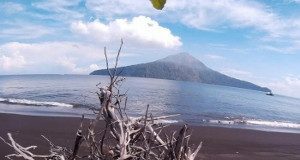 Mount Awu is a mountain with a type of stratovolcano located in the Sangihe Islands. Big eruptions occurred in the years 1711, 1812, 1856, 1892 and 1966 which caused more than 8000 people died from the eruption of Awu mountain. The Awu Mountain is one of 129 volcanoes on the archipelago ring track on the Indo-Australian, Pacific or Eurasian plate. Awu in Sangihe means ash so it is understood by the people of Sangihe that the mountain of the current Awu is only a remnant of the Mount Awu in the past who once presented deadly catastrophes. Colo is a cone volcano in Indonesia. This mountain is located on a small island in the middle of Tomini Bay, northern Sulawesi. 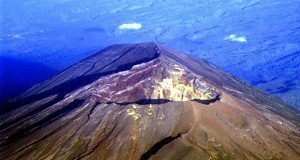 Colo Mountain is a solitary volcano in the Gulf of Tomini and is away from the subduction zone. Mount Tangkuban Perahu is one of the mountains located in West Java Province, Indonesia. 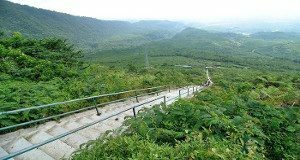 Approximately 30 km to the north of Bandung City, with big trees and fields of tea gardens in the vicinity, Mount Tangkuban Perahu has a height of 3,084 meters. The shape of this mountain is Stratovolcano with an eruption center that moves from east to west. 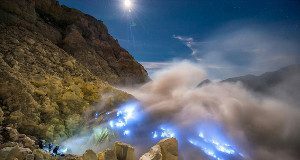 Mount Ijen is an active volcano located on the border between Banyuwangi and Bondowoso districts, East Java, Indonesia. This mountain has an altitude of 3.344 meters above sea level and is located side by side with Mount Merapi. Mount Ijen last erupted in 1999. 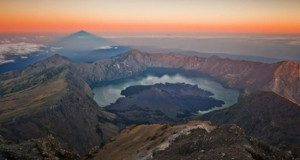 One of the most famous natural phenomena of Mount Ijen is the crater located at its peak. 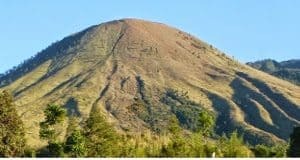 Mount Guntur is a stratovolcano-type volcano located in Sirnajaya, Tarogong Kaler, Garut regency, West Java, and has a height of 2249 meters above sea level. 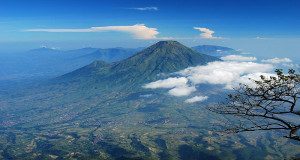 Mount Guntur was once the most active volcano on the island of Java in the decade of the 1800s. However, since then the activity has decreased. The eruption is generally accompanied by melting lava, spewing large rocks and other material objects. The recorded eruption of Mount Guntur is in 1847, 1843, 1841, 1840, 1836, 1834-35, 1833, 1832, 1832, 1829, 1828, 1827, 1825, 1807, 1803, 1815, 1809, 1807, 1803, 1800, 1780, 1777, 1690. The many mountains located in Indonesia can be both a blessing and also a curse. A blessing is of course many flora and fauna can be found scattered along the mountainside while the curse is because the imminent eruption that’s sure to bring disaster to many people living there. But this is just a fact that many people in Indonesia have to contend with and try to live alongside their rapturous nature.